Our family had never had a dog before, but we had been considering getting one for a long time. Last year we bought a bigger home in a new neighbourhood, and we finally decided that the timing was right to start looking for a dog to suit our family. 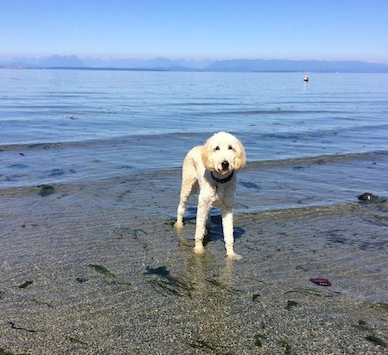 A companion to join us on walks through the neighbourhood or on camping trips throughout our beautiful province seemed like exactly what we needed. We looked at several local shelters for a rescue dog. Surprisingly, we found that they had very few dogs available, and the ones they had were not very family-friendly. We were disappointed, but not discouraged, so we turned our attention to breeders. We did some research, spoke to several dog owners, and eventually decided that a golden doodle was a good match for us. Our friends have a three year old golden doodle who is a great family pet, and the fact that he doesn’t shed any fur was attractive to us too. 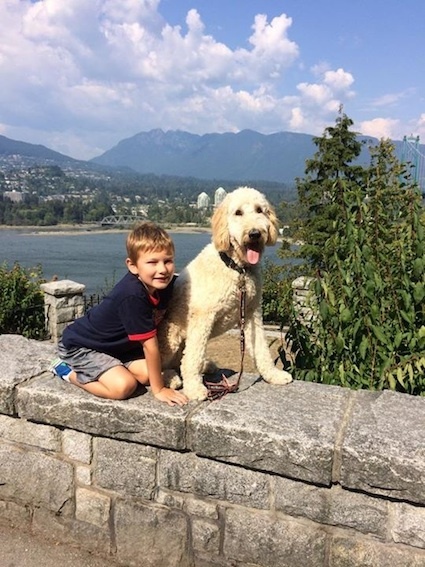 Some quick internet searches helped us locate a breeder in Maple Ridge that had an upcoming litter of golden doodles, so we put our name on the list to go and meet the breeder and the puppies. Anybody who has ever seen an eight week old golden doodle will understand how irresistibly cute these little guys can be. We had been told by so many people, “Don’t choose a puppy, let the puppy choose you.” How true that was. When we got to the farm and one of these little balls of fur just wouldn’t leave us alone – jumping, nipping, chewing shoelaces. Clearly he wanted to come home with us, and he did! ….and then the fun began. On the way home in the car, we came up with the name ‘Cosmo’ for our new puppy. He slept all the way home, and we thought this was going to be a piece of cake. After all, how much trouble could a little 9 lb. puppy cause, right? Wrong. We soon learned just how challenging a little puppy can be. He seemed to have boundless energy, and he just couldn’t help himself from biting anything he could get his little teeth on. They were just little puppy bites, but it was non-stop and it started to take its toll on us. Fingers, toes, socks, shoes, jackets – if he could bite it, he would. It didn’t take us long to come to the conclusion that we were clueless – we had no idea what to do to get Cosmo under control. Jack was 7 at the time, and was very intimidated by how uncontrollable Cosmo was. It’s not what he was expecting when we told him that we were getting a cute little puppy – it was all quite overwhelming for him. We had seen the Sit Happens van in our neighbourhood, so we looked up the website to see what they were all about. After reading a bit about the company, and watching some of the “Puppy of the Month” videos, we decided that we should give them a call and see if they could help us. It’s the best phone call we’ve ever made. Jeff came to our house one evening to meet Cosmo, and to give us a demonstration with his own puppy, Holly. Holly’s demonstration showed how disciplined she was, yet when Jeff gave her the appropriate command, she started bouncing around and playing with her ball, as happy as a puppy can be. We quickly signed up for the full training package and made an appointment with Jeff for our first lesson. Cosmo was going to be part of our family for a long time, so it was a very easy decision to make this investment in our newest family member. During our first in-home lesson, Jeff spent a lot of time telling us about the program and how we would learn as a family to train Cosmo. Then we set to work learning the first command, “come”. In one lesson, we had completely turned things around. Cosmo had learned the come command quickly and easily, and more importantly, we were now able to use the come command to start correcting his naughty puppy behaviour. If he started chewing on the shoes, nibbling some fingers, or just generally getting into mischief, a simple “come” is all it would take to interrupt the behaviour and have him come to one of us. Of course he still wanted to nibble, chew, and chase anything that moved, but now we had a simple method to change that. As Jeff told us, “Come fixes everything”. Jeff came for two more in-home lessons, and we learned a range of new commands that gave us more options for controlling Cosmo. Now that we had some of the basics, we were really starting to enjoy having him around, and he was learning to take direction very well. The “place” command is one that helped a lot. Cosmo quickly learned that when he is on his place, he’s not to leave it until we tell him to. We discovered a whole new level of freedom. “Place” now allowed us to cook a meal or do other household chores while keeping his puppy energy contained. We were even able to have friends over for Christmas dinner while Cosmo sat patiently on his place throughout our meal. He was only three months old at the time and we had completed just his first two lessons! After in-home lessons, we moved on to the puppy play dates, and eventually the outdoor classes in the park. Cosmo quickly learned to socialize with other dogs and to follow direction from us, regardless of the level of distraction. As Cosmo’s behaviour continued to improve, our neighbourhood walks became so much more enjoyable. We are often complimented on how well behaved Cosmo is when he encounters other dogs or neighbourhood children want to pet him. He comes with us when we walk to school with Jack, and loves all the attention from the kids when he gets there. Cosmo’s best friend, Maya, is a graduate of Sit Happens too. We regularly meet her at the park in the evenings, and the two dogs are allowed to run free and play together. They have such a good time and get great exercise because they have the freedom to run around the whole field. The training has given us complete confidence that the dogs will come back when called. Other dog owners have commented on how nicely the dogs play together and how well behaved they are. This summer, we took Cosmo on his first camping trip. We didn’t know what to expect. There are a lot of noises that he’s not used to hearing, and we wondered if he would be up all night or early in the morning after hearing birds, raccoons and other wildlife. To our delight, he was very well behaved the entire time, and really enjoyed himself. Every day he got lots of exercise and slept soundly throughout the night. I think he’s already looking forward to our next camping trip! In the months that have passed since we started, we have continued going to the classes to keep ourselves and Cosmo sharp. We always make sure that Jack is directly involved in handling Cosmo. Cosmo is now over 60 lbs. and very strong, so it gives us great peace of mind to know that Jack can confidently handle him even at only 8 years old and at the same weight as Cosmo. I’m not sure if we would have survived without the training, but thanks to Sit Happens, we now have a happy, healthy dog that we can play with and enjoy for years to come. Thanks Jeff, Marilyn, and Juergen – the Sit Happens team!